Rev Run And Justine Are Good People. In the Hollywood Gossip world of vicious rumors and juicy lies, it’s nice to have a feel-good story come along. Don’t get me wrong, I know there are lots of genuinely nice and caring celebrities, but we just don’t hear about them as often as we hear about Britney Spears descending into madness, Paris Hilton giving trashy skanks a bad name, or Lindsay Lohan going from an addiction to cocaine to an addiction to Sam Ronson. Joseph Ward Simmons (born November 14, 1964) is one of the founding members of hip hop group Run-D.M.C.. 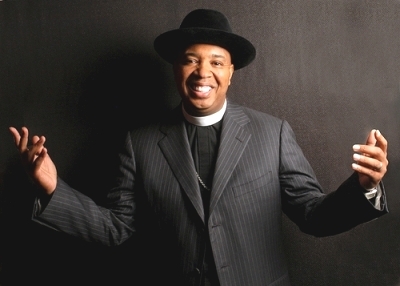 He is known as DJ Run, Joey Simmons or Rev Run, which is a play on his religious title. Born in Hollis, Queens, New York, he is the youngest brother of Daniel “Diggy” Simmons, Jr and Russell Simmons, Def Jam Records co-founder. He entered the scene via his older brother Russell, as a DJ for his first big act Kurtis Blow. He assumed the alias ‘Son of Kurtis Blow’, but later changed it to ‘Run Love’. previous post: Paris Hilton Pregnant? Yes. No. Maybe. next post: Wonder Woman Finds Dead Body.